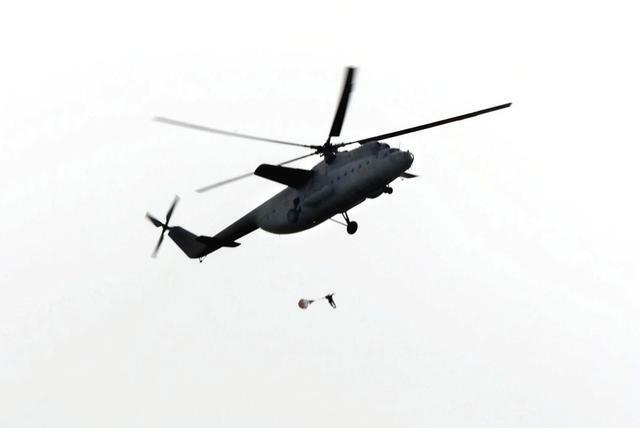 Almaty, Kazakhstan, 10 September 2000  Kazakhstan paratroopers are first into the drop zone, jumping from a MIL Mi-6 helicopter, as part of an international mass jump. Paratroopers from Kazakhstan, the United States and Turkey are descending into Kazakhstan to prepare for the start of the Central Asian Peacekeeping Battalion (CENTRASBAT). The CENTRASBAT 2000 exercise is a multi-national, in the Spirit of Partnership for Peace, peacekeeping and humanitarian relief exercise sponsored by United States Central Command (US CENTCOM) and hosted by former Soviet Republic Kazakhstan in Central Asia, 11-20 September 2000. Exercise participants include approximately 300 U. S. troops including personnel from US CENTCOM, from the US Army's 82nd Airborne Division, Fort Bragg, North Carolina, and 5th Special Forces Group, Fort Campbell, Kentucky, and approximately 300 Kazakhstan soldiers. Other participating nations include: Uzbekistan, Kyrgystan, The United Kingdom, Turkey, Russia, Georgia, Azerbaijan and Mongolia. The objectives of CENTRASBAT 2000 are to strengthen military to military relationships and regional security, and to increase interoperability between NATO and partner nations. CENTRASBAT originated in 1996, and was established to form a joint battalion of soldiers from the former Soviet Republics of Kazakhstan, Kyrgystan and Uzbekistan to serve as a key component in developing a regional security and cooperation structure. CENTRASBAT 2000 will test US and Central Asian unit's combat readiness and ability to conduct peacekeeping and humanitarian operations, as well as develop and build cooperative relationships between the respective states and assist in laying the foundation for future peacekeeping and humanitarian operations.